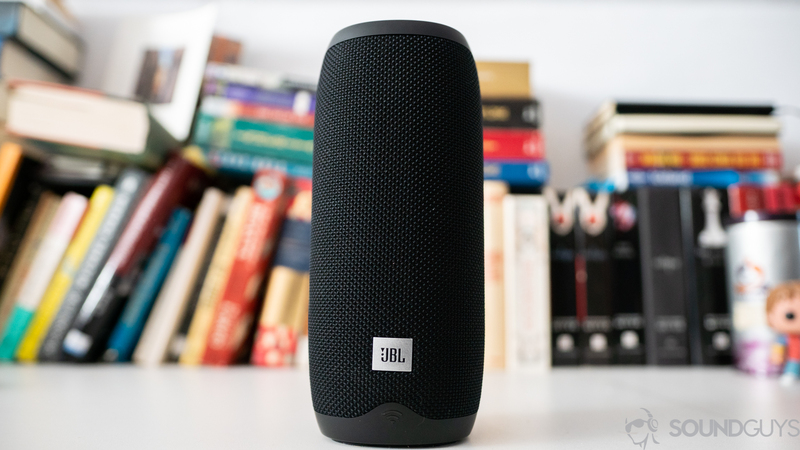 If you're looking to get your first smart speaker or want to add one to your existing setup, the JBL Link 20 is an affordable option that offers a surprising bang for your buck. Especially considering that you can just pick it up and take it with you on your next beach trip. The JBL Link 20 comes in a few different color options, but you can’t go wrong with black. Plenty of people have found that having a speaker with a smart assistant built-in can be useful for quick Google searches and controlling your music hands-free, but they’re not always the most portable solutions. Speakers like the Home Max from Google or even the Apple HomePod require that they are plugged into a wall and connected to Wi-Fi in order to work. Not to mention they’re quite expensive. Luckily, if you want something less expensive and way more portable, there’s the JBL Link 20. Unlike the Google Home Max, you’re able to connect to this speaker using either Bluetooth or Wi-Fi. But is it any good? Who’s the JBL Link 20 for? People without a smart speaker. If you haven’t yet bought a HomePod, Amazon Alexa, or Google Home, then the JBL Link 20 is a good choice for you as it combines the smart capabilities of those speakers with the ruggedness of one of the best Bluetooth speakers around. Android phone owners. If you have any of the Google Home speakers or plan on getting some in the future, this speaker will fit perfectly into that ecosystem. People that want the best of both worlds. If you can’t decide between a good, portable Bluetooth speaker or a smart speaker for your home, then the Link 20 was made for you. How is the build quality of the JBL Link 20? The JBL Link 20 isn’t a small speaker, but it’s still portable enough to throw in a bag when you need to. One thing that I’ve been noticing about speakers made by JBL is that they all share similar build materials, and the Link 20 is no exception. The speaker stands about 21cm tall and is wrapped in the same kind of fabric covering that you’ll find on the JBL Charge 4, Flip 4, and Clip 3. This means that besides looking really premium and feeling great in the hand, it’s also IPX7 waterproof which isn’t something you normally hear when it comes to smart speakers. Whether you’re using it in the kitchen and spill a drink, or in the yard and accidentally drop it in the pool this speaker can take it without breaking a sweat. One thing worth mentioning is that the speaker is fairly large, so even though it’s Bluetooth capable: I find it more useful indoors connected over Wi-Fi since you don’t have to move it around too much. If you’re looking for a portable speaker, then you’d probably be better off just getting something like the Flip 4 or the Clip 3. The JBL Link 20 is wrapped in a tough, waterproof fabric that is IPX7 rated. On either end of the speaker, you’ll find a smooth plastic finish, though the bottom has some added textured rubber to help with grip. On top is where you’ll find the playback controls along with a Bluetooth pairing and Google Assistant button. Then on the spine of the speaker are two more buttons. One is a mute switch that will turn off the microphone when you don’t want it to be listening for the “Okay Google” smart word, and the other is a power button which has fives small LEDs accompanying it to let you know how much battery life is left. On the bottom of the speaker is a small rubber flap that protects the micro-USB charging port from water damage, so take extra care to keep that closed shut as it’s basically the only weak point of the speaker. On the back is where you’ll find the power button as well as a mute switch to disconnect the microphone. As a smart speaker, the JBL Link 20 has a few more things to get right when compared to its Bluetooth-only siblings like the Flip and Charge series. For one, it has to be able to detect your voice from various distances and in a variety of settings. There are two far-field microphones up top that can pick up your voice, even when there’s music playing at max volume. It may not sound like it, but that’s really impressive and useful. You don’t know how annoying smart speakers can be until you’re yelling “Okay, Google” at the top of your lungs and not getting any kind of response. Voice commands also work fine outside, but I found that you have to be closer to the speaker for it to register since there’s so much going on outdoors. Another nice touch is the four LED lights built into the top plastic of the speaker which light up at the sound of your voice so you know exactly when the speaker is listening. They also act as volume indicators when you’re raising or lowering the volume. As similar as the JBL Link 20 is to other JBL speakers in build quality, it really sets itself apart when it comes to connectivity. As I mentioned already, on top of having Bluetooth 4.2, it also connects over Wi-Fi. Unfortunately, it’s lacking any high-quality streaming codecs if you want to connect over Bluetooth, but thankfully the Wi-Fi capability makes up for that. This means that you can extend the normally 30-foot range to as far as your router range. For me, this meant that while visiting family over the weekend I was able to listen to a podcast while showering and then bring the speaker straight to the backyard to the play music seamlessly and without a single skip. The JBL Link 20 has Chromecast built-in so if you’re using a streaming service that supports it, then you can connect to the speaker and control music easily if you don’t feel like using your voice. What sets the JBL Link 20 apart from regular Bluetooth speakers is the option to connect over WiFi and have full Google Assistant integration. Connecting to the Link 20 is easy. All you need is the Google Home app on your phone which is available on both iOS and Android. Open the app and select “Add” in order to start searching for the speaker. Following the on-screen instructions had me connected within a minute or two, and I don’t see it being too much of a problem for the technology-inclined so if you’re looking to get this as a gift for something they shouldn’t have any issues. Of course, you can also sync this speaker up with any other compatible speakers via the Google Home app, so if you already have a Google Home or JBL Link 300 then you can easily get an entire home system if you wanted to. The hardest part is customizing everything that the Google Assistant can do as even I find the app can be overwhelming, confusing, and jumbled at times. But if you just want to keep it simple, play and control music, and occasionally ask about the weather it’s super simple. As long as you don’t care about having the Assistant read out loud your upcoming events from your Google Calendar, you/they shouldn’t have any issues. The JBL Link 20 charges via micro-USB, which isn’t ideal in 2019. The JBL Link 20 is rated to provide you with 10 hours of constant playback, but at a constant output of 75dB we were able to get 8 hours and 45 minutes of playback. This isn’t great considering the size of the speaker and if you compare it to the 13-ish hours that the Charge 4 got during our testing, it’s not too far off. Still, it’s enough to get you through a day at the beach until you get home and can plug it back in. Another issue I found is that there’s a surprisingly long period of time before turning the Link 20 on and actually being able to use it. There’s a long pause between the power button lighting up and the sound that lets you know it’s ready to connect. It was so bad that I took out my stopwatch to time it and on three different attempts, I got an average of 29 seconds startup time. Not a huge deal to the overall usefulness of the speaker, but it’s definitely annoying. When it comes to sound quality, the speaker leaves a bit to be desired. I was expecting the same quality of something like the JBL Charge—not the most amazing sounding speaker, but still really good. Instead, the Link 20 doesn’t sound nearly as well-rounded. It isn’t terrible, but the low end is quite as defined and the bass in the song I’m Still In Love With You by Al Greene just felt like a lot of rumbling rather than a clear bass line. The JBL Link 20 frequency response is lacking in low end power, but it makes up for it in mids and highs. Though the emphasis is consumer friendly, this is one of those times where an upgrade to a larger speaker will earn its keep. Though the Link 20 is an affordable smart speaker, if you care about sound you want the JBL Link 300, Google Home Max or Apple Homepod. On the bright side, the mids and highs were pretty great. The claps and hi-hats throughout the song Shooting Stars by Bag Raiders all sounded nice and crunchy and the rising synths behind the vocals, which has a ride in prominence as the song goes, never took over and masked the vocals in the mids. It handled everything pretty well, though again the thinking low end wasn’t my favorite. While you’d probably be better off with something like the JBL Charge 4 if your main concern is portability and durability, the Link 20 makes a strong case for having one speaker that can do it all. The ability to take it outside while also adding it to your existing Google Home setup (if you have one) makes for a seamless Wi-Fi speaker setup that works anywhere around the house. Not to mention that the microphones do a solid job at picking up voices, even if the functionality is going to vary depending on how you use it. Plus, the IPX7 build makes it safe to use poolside or even in the shower. There’s also the solid 8-hour battery life which should definitely get you through a solid day at least. Still, as versatile as the JBL Link 20 is, the speaker isn’t perfect. Bass response is underwhelming and the lack of codec support means that your sound quality will suffer even more when connected via Bluetooth. Plus, it charges over micro-USB which is unacceptable at this point, regardless of the price point. Speaking of which, this speaker can be yours for around $100 which despite its flaws, makes this one of the better smart speaker options around.